Ami Lakoju (14) fights for a rebound against UC Irvine this season. Two words are useful to aid the recall of Ami Lakoju’s name: Amiable and likable. They fit the demeanor of the UCSB basketball player, a bear (6′9″ and 260 pounds) of a man. 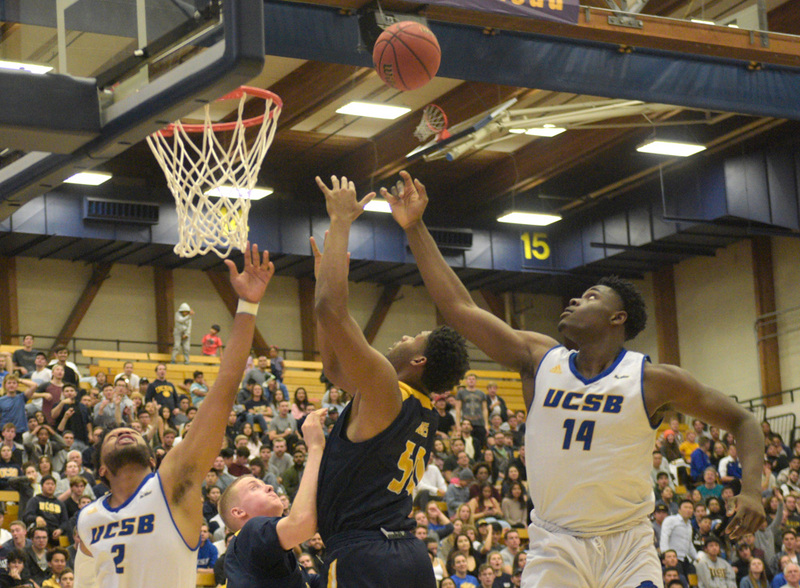 A fifth-year senior, Lakoju played his final home game at the Thunderdome last Thursday along with teammates Jarriesse Blackmon, Maxwell Kupchak, and Ar’mond Davis. They are a closely knit group, centered around Lakoju, to whom friendships are especially precious. Alex and Agatha Lakoju came from Harlem to see their son honored with the other graduating Gauchos. They will return in June to see him (full name: Aminenye-jesu Ohabamewo Lakoju) receive his bachelor’s degree in history, the culmination of one of the more remarkable journeys by any college athlete. When he arrived from New York to begin his UCSB career, it was the first time Lakoju set foot on the West Coast. He was recruited through a Twitter message from a Gaucho assistant coach. A welcome addition to the Gauchos’ front line, he saw 27 minutes of action in the first three games of the 2014-15 season. Then time stopped, along with his heart, for 90 frightening seconds. During a pregame practice at Oregon’s Matthew Knight Arena on December 21, Lakoju collapsed to the floor. Team trainer Katie Susskind found him unresponsive and administered CPR. Thoughts of Hank Gathers — the Loyola Marymount star who suffered a fatal heart stoppage during a game in 1990 — ran through the mind of Bill Mahoney, UCSB’s longtime sports information director. But while Mahoney was dialing 9-1-1, an Oregon official retrieved a defibrillator on hand for such emergencies. Several jolts from the machine restored Lakoju’s heartbeat. His life was saved by treatment that had not been immediately available for Gathers. He played in 15 games as a redshirt freshman in 2015-16. He was rusty and prone to commit fouls. The 2016-17 season got off to a promising start, but after 10 games, Lakoju was deemed academically ineligible. When he was unable to play, Lakoju started to dabble in art. He has created some striking digital content. During road trips, he has produced portraits of his fellow Gauchos. In his studies of world history, he has been fascinated by the feudal Japanese empires. Lakoju has seen action in every game and is averaging 2.8 points and 2.0 rebounds. In his longest stint against Bethesda, he posted a double-double of 16 points and 11 rebounds. He is making a robust 56.6 percent of his shots. Blackmon, a valuable asset on defense, and Kupchak, who seldom plays, have been Lakoju’s teammates for four years. “Kupchak is a unique dude,” he said. “We have conversations about how he approaches life. It keeps me grounded. Jarriesse is really loyal. If you need a guy to talk to at two in the morning, grab a bite to eat if you’re having a bad day, he’s always there. I’m the oldest player on the team, but I feel like Kupchak and Jarriesse have been like big brothers to me. I look up to them. The Gauchos are coming off a rollercoaster week. Five days after a rousing 82-67 victory over Cal State Fullerton, their Senior Night ended in a disappointing 69-64 loss to Long Beach State. With a record of 19-9 (8-6 in the Big West), they will try to gain momentum for the March 14-16 conference tournament at Anaheim in this week’s road games at Cal State Northridge and Cal Poly. WINNING WOMEN: After getting off to a 1-7 start in the Big West, UCSB’s women’s basketball team improved to 5-10 and clinched a berth in the conference tournament last week by battling to a 44-42 win over Cal Poly and stunning UC Riverside, 61-44. They won their last four home games. Paris Jones, a reserve guard, is their lone senior. “We call her Momma P,” said Coco Miller, a junior guard who put up 19 points, five assists, and three steals against UCR. Westmont College made history in the Golden State Athletic Conference tournament by winning the women’s championship for the fourth consecutive year. The Warriors will go off to the NAIA national tournament in Billings, Montana, next week with a young team (the only senior is reserve Roberta Hay) and a 24-7 record. They bought into coach Kirsten Moore’s emphasis on defense and downed The Master’s by a score of 60-50 in the GSAC finale.